Papaver glaucum is a native of the Near East where it is usually found at high elevations on sandy rocky mountainsides. Turkey Syria, Saudi Arabia, Iraq and Iran are all classic Tulip poppy territory. The Tulip Poppy is a prolific bloomer, one plant can produce as many as fifty large blooms during a season, which grow 6 to 10cm wide They are a delight to grow and very easy from seed. Papaver glaucum is closely related to Papaver somniferum and has the classic poppy markings – a stunning scarlet colour with clear black blotches on each petal. There are two main differences, firstly its size; it is quite diminutive in relation to its large cousins, growing to only 45 to 50cm. Its round, smooth pods are correspondingly smaller, at around 2cm long and the leaves are more deeply lobed than the leaves of P. somniferum. Sowing : Sow indoors in pots in Autumn or sow directly in Spring. Otherwise, sow direct where they are to flower in spring (at around 20°C / 68°F) in short drills 12mm (½in) deep. Cover lightly with soil, mark the sowing areas with a ring of light coloured sand and label if sowing more than one annual in the same bed. The seedlings will appear in rows approx 6 to 8 weeks after planting and can be told from nearby weed seedlings quite easily. Grow in deep, well-drained, fertile soil in full sun. Enrich soil with manure, compost or bone meal ahead of planting, (or any organic fertiliser rich in nitrogen). Poppies grow quickly; give sufficient water to increase both the number of flowers and their individual size. Although these poppies gobble up the nutrients, their eventual show will be more than worth the proper environment. Thin the seedlings out so they are finally 30cm (12in) apart by early summer. Be ruthless, just leave the biggest and most healthy looking. By doing this, you'll get more flowers and pods per plant that are bigger and stronger. Poppies don't need to be watered too often, but when you do water, give it a nice soaking. This will promote strong root growth. After about 6 to 8 weeks of vegetative growth, add a high Phosphorus fertilizer for the flowering stage. The most serious problem for these poppies is root rot. Excellent drainage is a must. Snails find the young leaves very tasty, so a snail deterrent is recommended. They can be prone to grey mold, but usually this is only a cosmetic issue. Once they get established, the plants are very hardy. 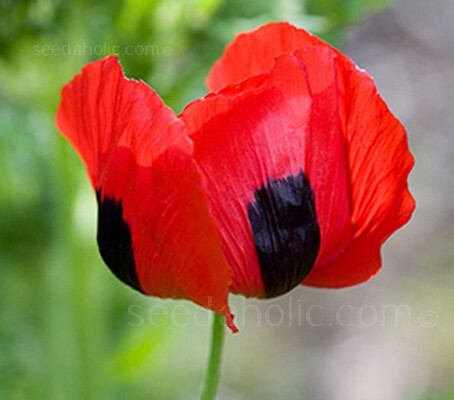 Poppies will begin to bloom 10 to 12 weeks from the time you plant them. Their pedals will drop after about 48 to 72 hours. The pods will continue to grow for the next couple weeks. During this period, it's very important not to water them unless absolutely necessary. Once pods turn a bluish tint with a white film on top, they are ready for harvest. The specific epithet glaucum is from the Latin meaning 'blue-green', referring to the colour of the leaves. It is commonly called the Tulip Poppy, due to the shape of the petals, and the Turkish Poppy from its origin. Full Sun. West or south facing. Sheltered.